The CDS Hooks API is still in active development and thus subject to change. We're currently working towards a 1.0 release and would love your feedback and proposed changes. Look at our current issue list and get involved! 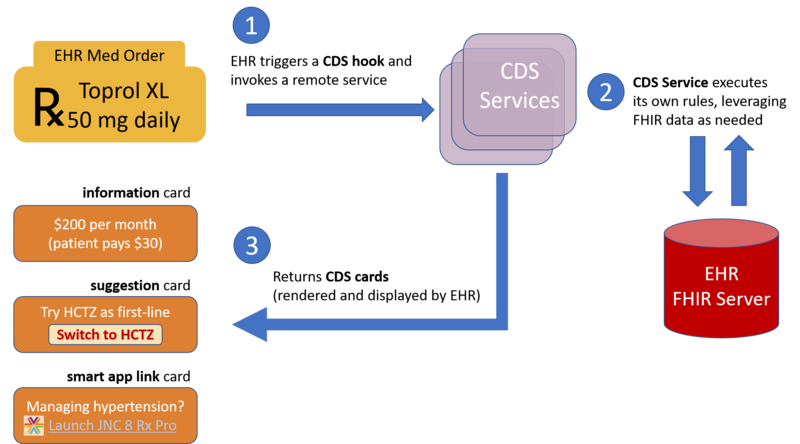 When a triggering activity occurs, the EHR notifies each CDS service registered for the activity. These services must then provide near-real-time feedback about the triggering event. Each service gets basic details about the EHR context (via the context parameter of the hook) plus whatever service-specific data are required (via the pre-fetch-template parameter). information card: provides text for the user to read. suggestion card: provides a specific suggestion for which the EHR renders a button that the user can click to accept. Clicking automatically populates the suggested change into the EHR's UI. app link card: provides a link to an app (often a SMART app) where the user can supply details, step through a flowchart, or do anything else required to help reach an informed decision.